Racks By The Tracks is back for it’s 7th year at Kingsport Farmer’s Market on Saturday, May 17th from noon to 11 p.m., bringing mouth-watering ribs, cold craft brews, and rockin’ music to Downtown Kingsport. There’s something for everyone to enjoy! In fact there is so much to enjoy that TALive broke down all the the fun going on at the festival so that you and your family can plan accordingly! There are a plethora of ticket options available to suit your needs whether you want to just sample the beers, just hear the music, or enjoy it all! We even have all inclusive weekend getaway packages available which include one night at the Meadowview Marriott Hotel, two festival tickets, and even transportation to and from the event! And don’t forget you save $10 when you purchase your tickets before May 1st! The Racks By The Tracks Festival will kick off the day to benefit a great cause with a 5K to benefit The Skin Cancer Foundation. All participants will receive a SPF 5K t-shirt, good bag, and free entrance to enjoy the concerts for the rest of the day! The Race will begin at the Kingsport Higher Education Center with the Kid’s Mile starting at 10 a.m. and the 5K Run/Walk starting at 10:30 a.m. The overall male and female race winners will receive a free pair of Newton running shoes! Afterwards, the run participants are encouraged to stick around and enjoy the rest of the festival! Imagine Texas alternative country with a kick of Tennessee twang. The edge of today’s country music with vocals reminiscent of the genre’s 1990′s boom. A hybrid encompassing a variety of southern roots, country and rock influences from Whiskeytown and Garth Brooks to Townes Van Zandt and Jimi Hendrix spliced with real-life Americana. Word of mouth and social media has given the band a fan-base that branches far from its East Tennessee roots and produced opportunities to share the stage with the likes of Josh Turner, Uncle Kracker, Trent Tomlinson, Corey Smith, James Wesley and The Jompson Bros as well as perform the Sprint Vision Pre-Race concert prior to the Irwin Tools Night Race at Bristol Motor Speedway in front of 100,000-plus. The Twang Bangers will kick off the festival at 12 p.m. In late 2008, Matt’s debut single, “Shine” debuted at #25 on iTunes country chart and the accompanying music video reaching #5 on CMT Pure and breaking into the Top 10 on GAC’s Top 20 Country Countdown. Stillwell has been touring in his custom wrapped bus called “The Mule” across the country headlining his own shows, as well as opening for country superstars such as Dierks Bentley, Jason Aldean, Gloriana, Luke Bryan, Blake Shelton and performing at huge music festivals like Country Thunder. Matt has released his sophomore album Right On Time to much fan anticipation. Stillwell is the first musician to be signed to NASCAR driver Kevin Harvick’s entertainment label. Matt Stillwell will take the stage at 3:30 p.m. Folk Soul Revival is a harmony drenched, boot stomping, rowdy, rootsy Americana band from the Appalachian mountain region of Virginia/Tennessee. FSR has just released their third album Prompting The Dapperness. The fan funded release returns to the formula that has continued to make the band so endearing- strong songwriting, sing along melodies, impassioned vocals and most of all honest music that resonates deep within the listener. Prompting the Dapperness reached #12 on the iTunes country charts and #99 on the overall charts on the day of its release, and has already charted on Billboard Magazine’s Heatseekers Charts. 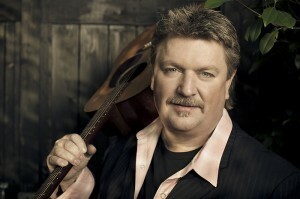 Folk Soul Revival will perform at 6 p.m.
With chart-toppers like “Pickup Man,” “Third Rock From the Sun,” and “John Deere Green,” 13 albums and over 20 Top 10 singles to his credit, Joe Diffie has little to prove at this point in his career. Yet he still has a fire in his belly to make good country music. With the release of Jason Aldean’s hit “1994” earlier this year that name-checked many of Joe Diffie’s twelve #1 hits, the legendary singer found himself squarely back in the hearts and minds of country fans. The multi-platinum-selling artist who dominated the charts during a hot streak in the 90’s has sold over 6 million albums. Diffie has never slowed down. He’s still writing, touring and recording a myriad of projects including his critically acclaimed 2010 bluegrass album Homecoming,, his recent Roots And Boots acoustic tour and collaborative album, All In The Same Boat, with fellow hitmakers Sammy Kershaw and Aaron Tippin. Joe Diffie will play at 8 p.m.
Catfish Frye Band is the Tri-Cities based “Rockin Boogie Blues” band! If you like to feel the soulful old school electric blues along with tappin’ your feet to the boogie feeling, then this is the band for you. The Catfish Frye Band will provide the perfect soundtrack to close out the 2014 Racks By The Tracks Festival with classic blues and rock covers. CFB takes the stage at 9:30 p.m. This year’s craft beer tasting station will be bigger and better than ever! Your ticket includes free reign of sampling from 2 p.m. until 7 p.m. of over forty different craft and micro-brewery selections! Did we mention you get to take home your commemorative sampling glass? There is also a High Gravity Beer Sampling ticket option featuring access to select beers over 5% alcohol content! Libation Station has a great view of the stages so you can have the best Racks By The Tracks Festival experience possible! Keep checking back to the Racks By The Tracks Facebook Page for the full list of beers that will be available to sample! Black Jack Corn-hole, the same organizers of the Corn-hole tournaments at Bristol Motor Speedway, will be bringing the excitement right here to Racks by The Tracks! The double-elimination tournament will start promptly at 2 p.m. and there will be prizes for the teams that finish in the top 8! Registration will cost $30 per group Start getting your team together today! Do you you have what it takes? Do you argue the merits of wet vs. dry ribs whenever the opportunity presents itself? Is your secret sauce recipe locked away in your safe? If so then you need to come test your barbecue mettle against the region’s best at Racks By The Track’s BBQ Cook Off Competition! All entrants will present their ribs for sale to festival-goers from noon until 6:30 p.m.. Contestants will be voted on in the People’s Choice Award contest, and the winner to be announced at 7:35 p.m. Less into cooking and more into sampling? We feel you. Bring your appetite, a few bucks, and a shirt that hides BBQ sauce, and you will be in hog heaven.